50 years after the Glassboro Summit, we should question the wisdom of leaders who seem averse to any kind of détente between the United States and Russia. By Norman Solomon. This article was first published on The Nation. When President Lyndon B. Johnson met with Soviet Premier Alexei Kosygin on a college campus in Glassboro, New Jersey, the summit brought a little warmth to dangerously frosty relations between the world’s two nuclear superpowers. By the time the leaders finished their discussions on June 25, 1967, the “spirit of Glassboro” had begun to melt a bit of Cold War ice. Today, it’s difficult to imagine any such meeting—and most of the Washington establishment seems to like it that way. Many congressional Democrats in particular have gotten carried away with attaching a large stigma to the very idea of “talking with Russians.” The goal of gaining partisan advantage over the Trump administration is clear enough. But 50 years after the Glassboro Summit, we should question the wisdom of leaders who seem averse to any kind of détente between the United States and Russia. What happened at Glassboro State College five decades ago should be seen as diplomatic summitry to be emulated, not an obscure relic from long ago. Yet few on Capitol Hill now seem mindful that what’s at stake in US relations with Russia includes the survival of people in both countries as well as the world as a whole. When it moved the Doomsday Clock even closer to “global catastrophe,” the Bulletin cited the deteriorating relations between Washington and Moscow as a major factor. The downward trend has involved the kind of hostile rhetoric that was supposed to have disappeared after the Berlin Wall fell and the Soviet Union dissolved. Last month I spent several days around Checkpoint Charlie, an epicenter of US-Russian tensions for decades. A profusion of stores and private museums—selling all sorts of memorabilia along the East-West fault line where the Berlin Wall once stood—provides an eerie atmosphere that blends Cold War nostalgia with an undercurrent of present-day foreboding. Strident conflicts between the two countries with the world’s biggest nuclear arsenals are no longer only in the past. The spirit of Glassboro was a limited breakthrough. It did not prevent the next year’s Soviet invasion of Czechoslovakia or the continued American escalation of the Vietnam War. Diplomatic dialogue at the highest levels is certainly no cure-all. But such dialogue can decrease the risks of unfathomable catastrophe. 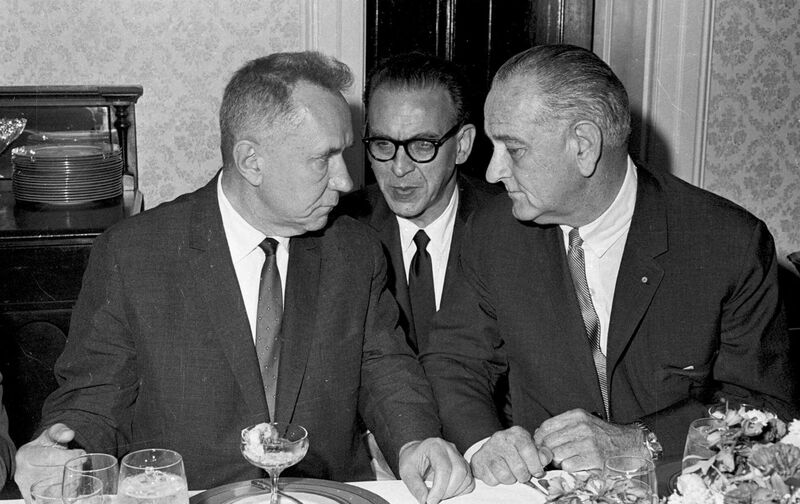 Members of Congress who keep stoking the fires of antagonism toward Russia would do well to consider the words of President Johnson as he stood next to Premier Kosygin after more than a dozen hours of direct talks. “We have made further progress in an effort to improve our understanding of each other’s thinking on a number of questions,” Johnson said. That might not sound like much. But with mutual hostility now at fever pitch in Washington and Moscow, such understanding is essential. Whatever the truth may be about Russian interference in the US election last year, an overarching truth continues to bind the fates of Russians, Americans and the rest of humanity. No matter how much we might wish to forget or deny it, we are tied together by a fraying thread of relations between two nations that possess 93 percent of the world’s nuclear weapons. Right now it is not popular to say so, but we desperately need each other to enhance the odds of human survival. For the sake of future generations, we need to rekindle the spirit of Glassboro.